Enough is enough, talk to me with smile. Seek your master, say your prayers and surrender to God. Hide not behind the veil, my love, I long to have a glimpse of you. Its all in the One contained, understand that one and forget the rest. How long can the truth be veiled? The spirit is all there is to know. 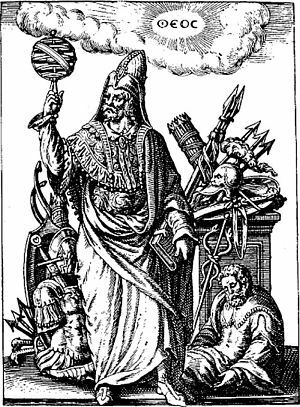 You who have read thousands of books of knowledge,have you ever tried to read your own self? The sun has set, its flush only is left. I’ll give my life for a glimpse of you. If I search for you for you inside, then I think you are confined. If I search for you outside, then who is contained within me? You are everything, you are in everything, you are known to be free from everything. You are me and I am you, so who is poor Bullha? Sings and dances out of tune. No questions and no answers remain. He is fulfilled with his Love. He just enjoys his ecstasy. A black face and blue feet? I am neither Moses nor Pharaoh. Bulleh, I know not who I am. Nor in sleep or waking known. Not in happiness or in sorrow am I found. I am neither pure nor mired in filthy ground. Nor am I in air or fire to be found. Not a Buddhist or a Christian. I am not of Eve and Adam. I have not chosen my own name! From first to last, I searched myself. None other did I succeed in knowing. Not some great thinker am I. Who is standing in my shoes, alone? 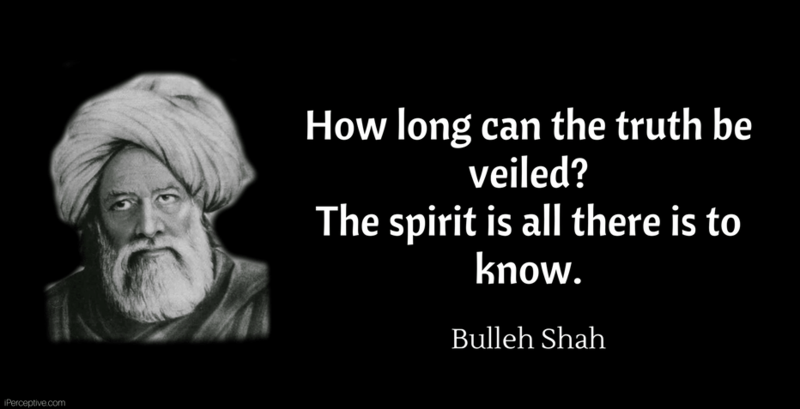 Bulleh Shah was a Punjabi Sufi mystic poet, humanist and philosopher who lived during the Mughal Empire and era. 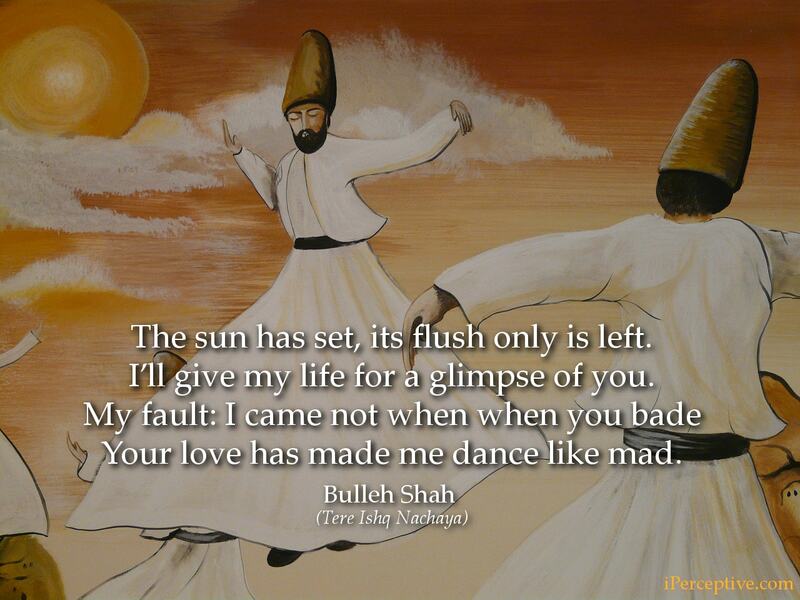 He is best known for his devotional sufi poems dedicated to the Beloved.